Jazz up any favorite space in the house! Dry fruit slices are pretty common Christmas and holiday decorations. I loved smelling the warm aromas of dried apples and oranges hanging from trees when I was young. It wasn’t until I was off in college that I learned to do it myself. Here is a low cost alternative to buying store bought dried fruit. String a needle with thread through dry fruit to hang. 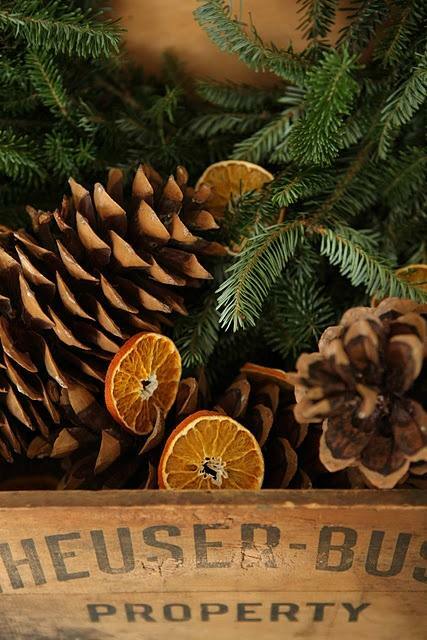 Place in baskets and boxes with decorative earthy items such as pin cones, cinnamon sticks and fresh pine branches. Pair with other dry fruit and make a beautiful display basket for counter tops and bathrooms. Spruce up branches by sticking dry berries on the end. Decorate Christmas trees by placing dried slices in branches. Sort fresh fruit and select only the pieces that are perfectly ripe. Use fruit with good, bright colors and is without any bruises/rotting discoloration. Slice the apples and oranges into 1/4 inch slices crosswise and dip them into a solution of half lemon juice and half water. This step will keep the fruit from turning brown and will also show off the pretty seed core. Next, blanch the fresh fruit in a pot with water on the stove top. Make sure the water is boiling then lower the fruit into the pot and blanch for five minutes. Have an ice bath near by. After 5 minutes, remove the fruit and place directly into the ice bath to lock the fruit’s colors in. Dry the fruit with paper towels. The fruit can then be dried one of two ways: in the oven or in the sunlight. Put a piece of parchment paper on a baking sheet and spread the fruit on the sheet evenly, so the pieces don’t overlap or stick to each other. Place fruit in the oven and bake it at 145 degrees Fahrenheit for 4-5 hours. If you have chosen to dry the fruit in the sunlight, leave it in the sun for 2-4 days until the fruit has completely dried. Also, bring the fruit inside at night if you choose to use this method.